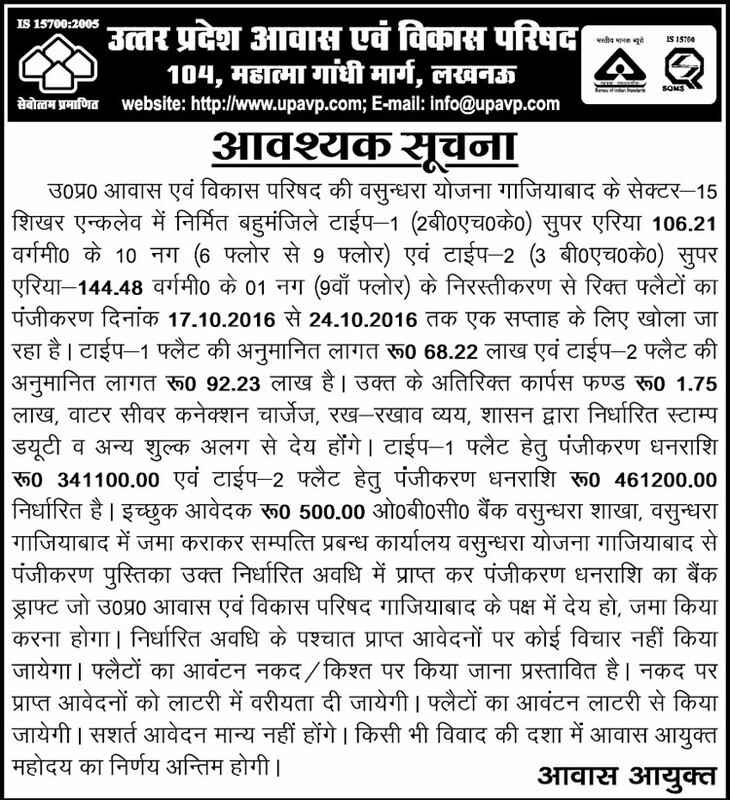 Uttar Pradesh Awas Vikas Parishad invites applications for the allotment of housing units in UPAVP Shikhar Enclave located in Vasundhara Yojana Ghaziabad at Sector-15 under new housing scheme 2016. Registration for the allotment of flats in the scheme will start from 17 October 2016. UPAVP Vasundhara Yojana offering two type (Type-1 2BHK and Type-2 3BHK) of flats and these housing units are constructed on 6 yo 9 floor building. The super build-up area of 2BHK flat is around 106.26 square meter while the 3BHK flat is available in the super build-up area of 144.48 square meter. Estimated cost of Type-1 flats is around Rs. 68.22 Lakh and for Type-2 flats the estimated cost is Rs. 62.23 lakh. How to Apply: UPAVP has offering these housing units for a limited time period of one week. Registration for flat in the scheme will start on 17 October to 24 October 2016. Application form will only be filled within the registration period, after that UPAVP will not consider the any applications. Applications form will be available in OBC Bank, Vasundhara Ghaziabad at the cost of Rs. 500/-. And completely filled applications form to be submitted in the Property Management Office, Vasundhara Yojana Ghaziabad along with registration which to be submitted in the form of bank draft in favor of UP Awas Vikas Parishad, Ghaziabad. The allotment of flats will be done through draw of lots. For further information visit the official website of UP Awas Vikas Parishad at www.upavp.com.